Try our delicious local food in Warung Chain. 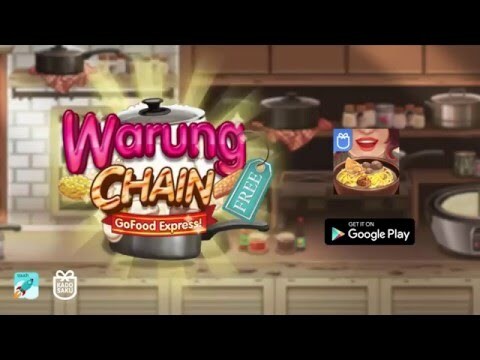 Warung Chain: Go Food Express is a fast paced cooking game from the makers of Ramen Chain. From the creator of Rapstronaut : Space Journey Game. You will play as a warung (small street food in Indonesian) owner trying to share happiness through good delicious food. It's FREE and addictive! Have you ever heard of Indonesian food like bakso, martabak, ayam goreng, and nasi bali? Now you can experienced it in this game. Cook and serve delicious foods ranging from snacks, breakfast, lunch, to dinner. Fast reflex, quick thinking and an appetite for famous Indonesian foods is what it takes to play this game! Loads of hungry customers craving for express service in front of your shop, make them happy! Experience local kindness and play through various popular tourist destinations spots in Indonesia, Encounter diverse customers and obtain knowledge about delicious Indonesian foods and culture. Various foods from warteg, martabak, to bakso malang and tahu bulat ready to be cooked and served. Don't forget to share your delicious meals with your friends on Facebook! Now do you have what it takes to become a foodpreneur? test your skill in Go Food Express! make the customer happy, beat your friends’ High score or help them to progress, the choice is up to you! One thing for sure, Customer satisfactions guaranteed!! Come on! play this super addictive game before the customer run! - External storage access is used for save game & caching video purpose.